Earth Day Festival Benefit was a blast. 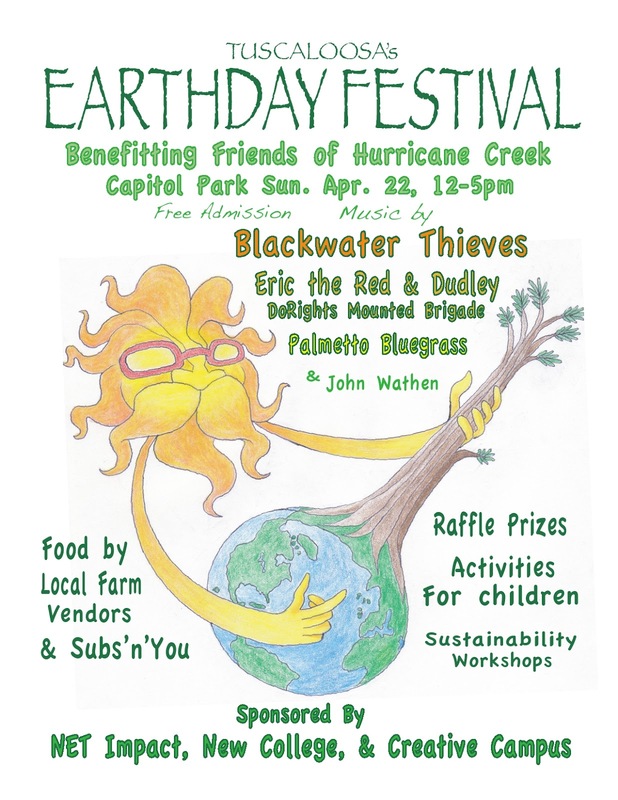 The Friends of Hurricane Creek enjoyed beautiful weather, music, food, and outdoor revelry at the 2012 Earth Day Festival sponsored by UA Chapter of Net Impact. If you haven't heard of Net Impact yet, then you're in for a nice surprise, since they are spearheading incredible ventures in social entrepreneurship hailing from our very own UA Manderson Business School. Aside from the thrill of being the beneficiaries of money raised at this event, we were excited to learn that local business students were so engaged in giving back to their communities (and the world at large). Human and canine Earth Festers enjoy the weather and music at Capitol Park. Our networks first tangled at the Annual Creek Cleanup in March of this year, when a friend of MBA candidate Austin Creel dropped by and lent a hand in clearing debris. Before long, Net Impact decided to host an Earth Day Festival (which used to be an ongoing Tuscaloosa tradition but somehow petered out over the past few years). Admission was free, yet many stopped to buy raffle tickets to benefit FOHC, which seems to suggest that you can offer free events which engage the entire community while raising money for specific local nonprofits. ECoCouncil members set up for the event. The UA EcoCouncil is always there to represent where anything green is involved. We were proud to be their neighbor table. Creekkeeper John Wathen shared about his ongoing efforts to restore the two linear miles of Hurricane Creek damaged in the 2011 tornado. As a resident of Holt, John also touched upon the difficulties for Holt citizens in rebuilding and recovering from the tornado. Where there is good music, there is always a good sound man. 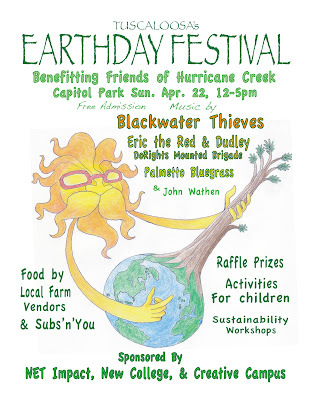 Music for the day will be performed by Blackwater Thieves, Eric the Red & Dudley DoRights Mounted Brigade and Palmetto Bluegrass. A little more about the music which kept even older dads dancing seems in order. The Blackwater Thieves are a Tuscaloosa band with their own vibrant take on life. Listen and "like" for yourself at their Facebook page. Fans of the wah pedal won't be disappointed. Catch a video and audio of Eric the Red & Dudley DoRights Mounted Brigade live to understand why all this genre-bending in music is a creative boon for the rest of us. Palmetto Bluegrass hails from Kennedy, Alabama and we would love a link about them to share with you (though contact info is available at Alabama Bluegrass Music Association). If you'd like to enjoy more music outdoors, don't miss the events at Mossy Oak Music Park. Sam King and Micah Coryell paint rocks. Kids painted rock creatures and planted seeds inside egg shells- a highly successful venture to which I can attest because Max Coryell is currently seeking garden space in which to plant his thriving squash plants from this event. Successful planting workshops for kids added a touch of brilliance, since Max asked me when this event would happen again so he "could learn how to plant more." I'll leave that question to open for Austin and all the other wonderful people who participated in pulling this together. Thank you for making Tuscaloosa a hoping-towards-green place to live.